Artists in India's Bihar state are painting images of Hindu deities on trees to save them from being cut down and to protect the environment. Using a tribal art form called Madhubani - which takes its name from a district - they are decorating tree trunks with colourful paintings. The subjects of the 16th century art are usually Hindu gods and goddesses like Krishna, Radha, Durga and Saraswati. The artists hope that the drawings would deter god-fearing Indians from cutting the trees. As you drive along highway 52 in Madhubani district, you will pass more than 100 trees that have already been decorated with the paintings. "Not a single painted tree has been cut down yet," says Arti Kumari, one of the dozens of artists who have joined the campaign. She has been painting Madhubanis for the last five years and is happy that "for the first time she is doing something to protect the environment in an effective way". The unique project was initiated in September by Shashthi Nath Jha, who runs the Gram Vikas Parishad, a local non-governmental organisation. Our message is to protect our green cover. "In the name of development and road expansion, trees are being cut down everywhere. The villagers are not aware of the issues of climate change or ecological balance," says Mr Jha. At under 7%, Bihar has one of the lowest forest coverage areas in India. Madhubani painting has a geographical indication status because it has remained confined to a compact geographical area where the skills have been passed on through centuries and the content and style have largely remained the same. Traditionally women and girls used to decorate walls and floors during festivals and weddings with natural colours using religious and mythological themes. The figures are boldly outlined with bulging fish-like eyes and pointed noses. When we visited Ranti village in Madhubani district, we saw several men and women painting the leaves on a tiny tree. "Our message is to protect our green cover," says Mr Jha. "We have also requested the government, railways and other agencies to come forward and support our campaign," he adds. Mr Jha says the campaign is an expensive exercise. "Painting a tree and to protect it from animals and other threats, requires 2,000 rupees ($36.28; £22.77) to 3,000 rupees depending on the size of the tree." But unlike traditional Madhubani paintings, here in this campaign the artists do not use natural colours "as it will not last long". 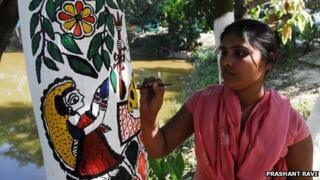 "We use lime, glue and synthetic enamel paints so it will last for a minimum of three years," says artist Seema Das. Villagers believe the campaign can be promoted to bring tourists to the region. The Madhubani artists believe that they are showing the world how an art form can be used to convey a strong social message "in an effective way". "Even if no one comes to support us, we'll not stop and will continue to paint as many trees as we can in the coming days," says Mr Jha.